There have been numerous examples where the concept of a destination wedding had us drooling all over the place. Be it the Royal wedding of Prince Harry and Meghan Markle, or the big fat Indian weddings like that of Lara Dutta in the luxuries beaches of Goa or in the 1000 year old monastery in Austria that saw Celina Jaitely share the vows with her beloved. The Big Fat Indian weddings are just becoming obese with time, convincing people to step up their level every time. These weddings at exotic locations have become a trend in the industry which is increasing by approximately 25% per year according to some of the biggest Industry Analysts. The auspicious Indian wedding season starts from late September and stretches to February, where it is like a fierce competition in which the bride, groom and their respective families try to add a wow factor to make their wedding a hot conversational topic for times to come. To make their wedding a high profile, talk of the town many people choose aircraft services. Lifting this wedding scenario up in a private airplane is like taking things to a high altitude. The trend to book private jets for romantic gestures such as proposing, bachelorette or bachelor’s party or the wedding day is taking over various families. As per a leading travel agency, there has been a fair amount of increase in the tourism of approximately 35% to 40% and out of these; the wedding season is a major contributor with 10%- 15%. 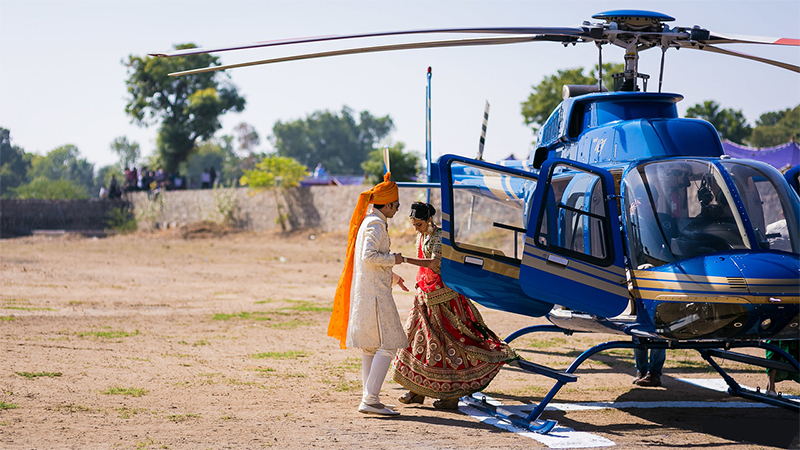 For a matter of fact, the big fat Indian weddings are now turning into detailed affair where using aircraft services for both National and International destinations have become a common practice. The increased spending power has given couples the freedom to hire private airplanes within and outside the country. These big fat Indian weddings are most popular in Indian destinations like Udaipur, Goa, Jaipur, Manali and International destinations like Thailand, Hawaii, Singapore and Malaysia. These destinations and many more call for the best aircraft services such as Arrow Aircraft that your family and guests enjoy to the fullest. Weddings now have become a billion dollar business with lots of wedding planners now inspiring the bride and groom to opt for exotic destinations, book private jets, wear designer clothes etc. The tourism embassies of various countries are not far behind; they provide great offers for you to experience the best possible big fat Indian wedding! There are many newer destinations that are attracting the bride, groom and their families, such as Ooty, Rathambore and Jodhpur etc. where many celebrities have in the recent past held their big fat Indian weddings. To make this experience a delightful one for their guests, these celebrities almost always choose to book private airplanes. After all this discussion, it seems clear that destination weddings are gaining immense popularity. When you choose to get a destination wedding, it is not only just about the right location but it is also about providing your guests with the services that give them the comfort to reach that location, which is so far off from the soon to be married couple! When you have to provide your guests with the best services, why not choose to book private jets that are absolutely class apart and have the best possible services. This will help you to transport your guests from smaller cities like Pune, Indore and Jaipur etc. to both the National and International destinations in a hassle free manner. Using private airplanes for the convenience of your guests will provide them the comfort of being by your side on your big day in style. Also it is an extremely easy way to go from point A to B. Why to book private jets to add a Wow Factor to the Big Fat Indian wedding? 1. Choosing a great aircraft services like Arrow Aircraft helps you to reduce travel time in comparison to road transport or rail transport. Also in comparison to a regular flights you get the option to cut the in- between stoppages. 2. The private charter can be scheduled according to the time that suitable to all guests and family members. 3. This will also help you to save time and money, as you don’t have to stay in the hotel for extra days because the flight available was 1 or 2 days later. 4. No need to wait in the airport boarding queues. 5. No need to reach extra early at the wedding location and wasting time. 6. Book private aircraft and offer your guests with lavish meals, even for shorter flights. 7. Leave your guests with the memories and an experience that they would never forget. Book your private airplanes with Arrow Aircraft to give your guests a comfortable travel journey!